Apple has updated their Apple Store app, the latest update adds some improvements including location aware check-ins and reservations. 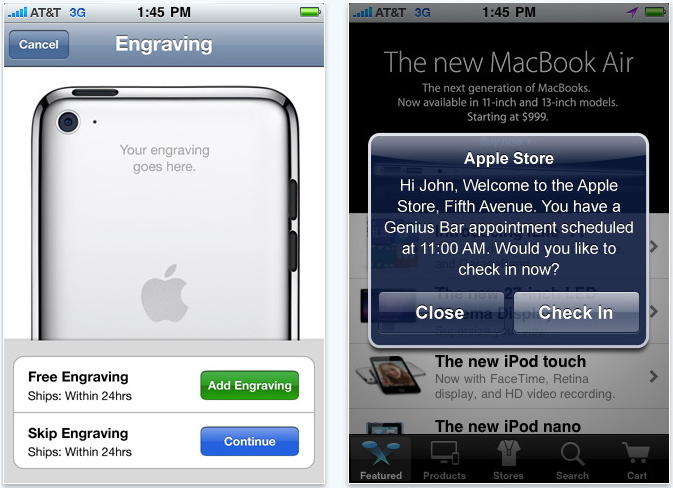 Add engraving and gift wrapping to select purchases from the Apple Online Store. Reserve products for pickup at an Apple Retail Store. 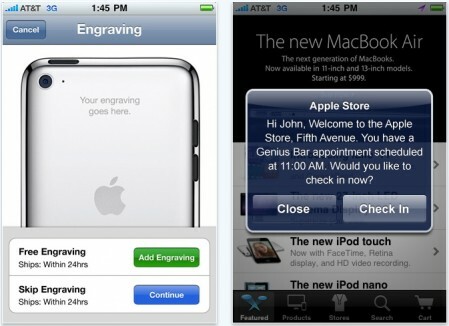 Check in for reservations and request help within stores (iOS 4 required). Please note: With Location Services on and the Apple Store app open, Apple will use your location to identify nearby Apple Retail Stores and to offer additional services when you are in a store. If you have previously opted into the Apple Store app using location but do not want this new feature, you can update your Location Services preferences in General Settings. The app is free, available for the iPhone & iPod touch and available on the US iTunes App Store.